In other words, I usually don’t particularly care about Defectors. Headlines like Junta, or a Turn 1 Suez Crisis are great, but not the end of the world if they get cancelled. As USSR, if I draw Defectors on Turn 1 or 2, I will try to hold it until Turn 3 before playing it for Ops. This keeps it out of the Turn 3 reshuffle and ensures worry-free headlines for most of the game. This is analogous to the US holding Decolonization/De-Stalinization until Turn 3, though Defectors is not nearly as important as they are. 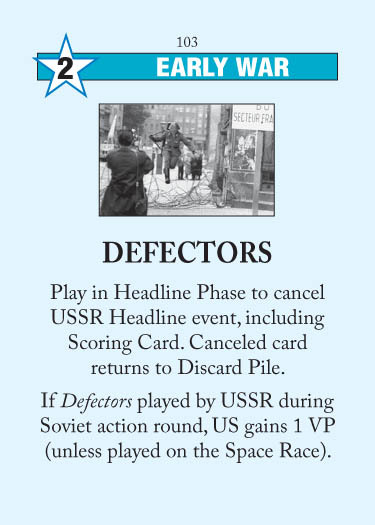 A common USSR trick against Defectors is to headline a scoring card for a region that you are being Dominated in. This is most effective when against a relatively inexperienced US player, and when you haven’t seen Defectors come out Turns 1 or 2 (meaning it is guaranteed to be in his hand on Turn 3). It is one of the rare ways to discard a scoring card without scoring the region. Of course, you can also headline an actively-dangerous US card when you expect the US to be headlining Defectors, but that’s much more risky, whereas the downside risk of headlining the scoring card is much lower. Most beginning players are too eager to headline Defectors. Not only is it risky on Turn 3, as described above, but more generally, I prefer to headline more aggressively as the US (e.g., Red Scare/Purge, Grain Sales to Soviets, The Voice of America). Obviously you don’t always have the luxury of such powerful events, but in general, cancelling the USSR headline doesn’t seize the initiative and keeps you on your heels. That having been said, Defectors is a fine headline. By preventing the headline-AR1 combo, you negate one of the USSR’s most powerful weapons against you. If I draw it with a powerful headline I will headline the other card and hold Defectors until next turn. A quick rules clarification: Defectors, if headlined, will always cancel the USSR headline regardless of Ops value. The edge case is: if you headline Five Year Plan and draw Defectors, Defectors will now only cancel the USSR event if the USSR headline triggers “after” the Five Year Plan headline. In other words, if the USSR headlines a 4Ops card, it wouldn’t be cancelled by the Five Year Plan – Defectors interaction, but any 3 Ops or lower headline will be. Finally, and this should go without saying, if the USSR has made it to the stage of the Space Race where he can see your headline before he chooses his, do not choose Defectors! All you’re doing is allowing to discard a US or scoring card of his choice. This entry was posted in Early War, US Events and tagged defectors. Bookmark the permalink. If you are holding Defectors and playing the “other card”, how do you “negate one of the USSR’s most powerful weapons against you”? Sorry, those are supposed to be separate thoughts. Edited for clarity. Though I’m sure you’re aware, I thought I’d point out that the card list doesn’t yet have the link to this Defectors article. Very good review of the card. IMO, Defectors is definitely one of those where the threat is worse than the event. It’s not so much having your headline cancelled that hurts, it’s not being able to headline what you really want to for fear of it being cancelled. As the US, I usually try to hold it for as long as practical (i.e. without forcing myself to play bad cards) as it messes with the USSR mind, and makes him think twice before dropping Red Scare on the headline, plus it’s always a decent shout as US headline. Also, does anyone know why Defectors is card number 103? Was it originally a Late War card? In the (admittedly unlikely) event of the USSR headlining Defectors, does it cancel itself? Therefore no VP to the US?